Translator Wanted: Seoul Selection is looking for full-time and part-time Korean-to-English translators to work on our various translation projects. Those interested should send a resume and cover letter to hankinseoul@gmail.com. 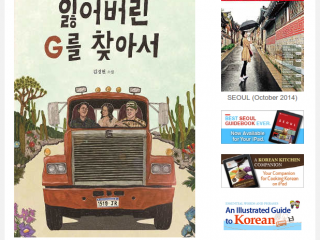 Celebrate the beautiful Korean autumn with a nice, warm copy of the October issue of SEOUL, Seoul Selection’s monthly travel and culture magazine. 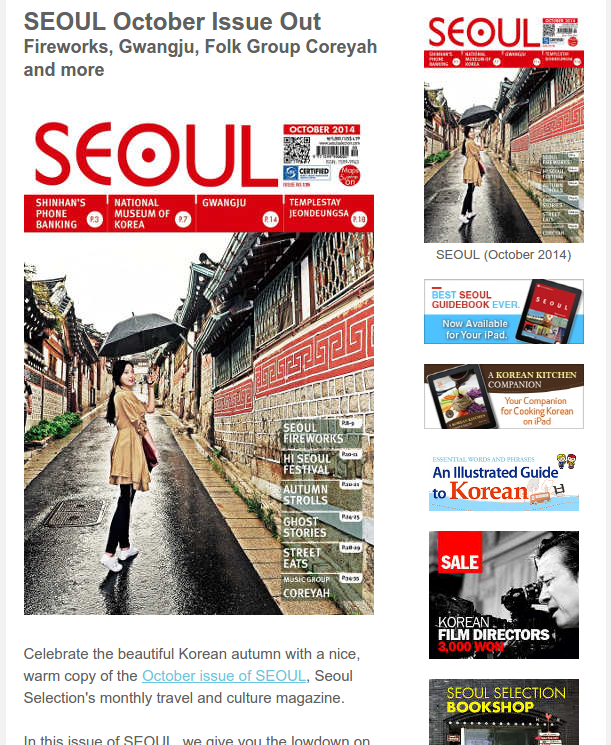 In this issue of SEOUL, we give you the lowdown on the Seoul International Fireworks Festival, introduce the MICE opportunities of Gwangju, meet the Korean music group Coreyah, go on a Templestay at Ganghwado’s Jeondeungsa Temple and explore Seoul’s street food scene. If that’s not enough, there’s always our Goings On Around Town, our listings of the month’s concerts, festivals, exhibits and other happenings. So go out and get a copy while it’s still got that new magazine smell. Oh, and don’t forget about our mobile magazine apps! (iOS, Google). The mobile version of the October issue will be available early next week. Korea signs an FTA with Canada. Sam Hammington in the Daily Mail. Not everybody loves the new Yi Sun-sin movie. Japanese women who escaped North Korea have a difficult time adjusting. Is Korea’s school trip culture changing in the wake of the Sewol sinking? Expected autumn foliage times and beautiful photographs. Sea of clouds beneath Guksabong peak. Sunset over the Cheongbyeok Bridge. To counterbalance our busy and hectic lifestyles and mindless consumerism, the idea and importance of healing is spreading in Korea. True to this idea, the photo series Jean Paul Soulscapes by Matthias Ley offers quiet photographs of the landscape of Germanyâs Northern Bavaria: Open farmland, fields, paths, trees, clear horizons, clouds and wide views during all seasons. For German photographer Matthias Ley, creating this photo series also allowed some personal healing. The love story of Chunhyang is one of Korea’s most widely known stories. 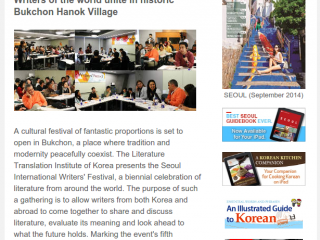 Originally told in the form of pansori, a traditional genre of musical narratives. It’s a moving tale that tells of the love between Chunhyang, the daughter of a gisaeng (a female entertainer), and Mongnyong, the son of a local government official. Yi Mongnyong, studying hard to earn his own title within the government, steps out one day to get some fresh air. The minute he does, however, he’s greeted with the sight of Chunhyang, who is unbelievably beautiful. Entirely smitten and robbed of his logic, Mongnyong orders his servant to ask Chunhyang to accompany him. When she refuses, Mongnyong talks to her mother, Wolmae, and asks for permission to marry Chunhyang. Wolmae, who’s delighted to marry her daughter off to a good family, gives her blessings, and the two marry on that very day. Conveniently enough, Chunhyang ends up sincerely falling in love with Mongnyong, and the two grow to be a happy couple. Unfortunately, Mongnyong is forced to leave for Seoul due to his father’s work, making him leave his wife behind for some time. A new lord arrives in his absence, a greedy and wasteful glutton who enjoys partying and lechery. Although Chunhyang is already married, the new lord tries to make her sleep with him, but she refuses. Furious at such a rejection, he punishes her with imprisonment. When Mongnyong passes his exams and returns as a respectable civil servant, he finds out what happened to his lovely wife. He then punishes the new lord and goes on to live happily ever after with his beloved Chunghyang. Interested in seeing such a beautiful story in ballet form? Check out the Universal Ballet Company’s interpretation. The Curtis Institute is a music conservatory in Philadelphia that is one of the most selective institutes of higher education in the United States, with a student body of around 150 to 170 students. The upside of their discerning admissions process, however, is that all who are admitted receive a full scholarship, and nearly all pupils are trained to fill specific places in a number of orchestras or opera companies, mainly the Philadelphia Orchestra. Pianists, organists, singers and composers are offered a chance to apply. As part of the schoolâs curriculum, Curtis on Tour is a performance series organized by the institute to provide pupils with the opportunity to gain real-life experience in venues all over the world. Students have joined celebrated Curtis alumni and faculty on a world tour every year since 2008, a perfect way to put into practice the philosophy of learning by doing. The series is led by Principal and Director of the Curtis Institute Roberto Diaz, as well as lead violinist Eunice Kim, a Korean-American Curtis alumnus from San Francisco. GETTING THERE: Gwanghwamun Station ê´íë¬¸ì­(Line 5), Exit 7. Walk straight for 200 meters in the direction of Seodaemun. Join the Orchestra Della Svizzera Italiana (OSI), or the “Orchestra of Italian Switzerland,” for a marvelous concert with legendary pianist and conductor Vladimir Ashkenazy. Founded in the 1933 under the auspices of Italian Swiss Radio, the orchestra originally performed as a radio orchestra for the Italian-speaking regions of Switzerland, with the city of Lugano as their base. Later, with the introduction of television, the orchestra was rechristened as the Radio-Television Orchestra of Italian Switzerland, though didn’t take its current name until 1991. The most famous composer to produce a piece specifically for the orchestra is Richard Strauss (1864–1949), who offered his Duet-Concertino in F major. The orchestra is also proud to announce the inclusion of guest Conductor Vladimir Askenazy, who began playing piano at age 6. After studying at the Moscow Conservatory, he won second prize in the International Chopin Piano Competition in Warsaw in 1955. After being harassed by the KGB and refusing to cooperate with Soviet authorities, Ashkenazy used his international fame as an artist to gain leverage to move out of Russia. Being married to an Icelandic woman, he eventually settled in the Nordic nation and became an Icelandic citizen in 1972. Enjoy a stylish party with top British producer and electronic artist DJ Stevie Kotey at the W Hotel. ADMISSION: KRW 40,000 with 1 welcome drink. KRW 30,000 with 1 welcome drink for early birds. Jeondeungsa Temple, located in the lushly forested mountains of Gilsang-myeong, Ganghwa-gun, Incheon, is the ideal place to escape the hustle and bustle of city life and rejuvenate oneâs mind and soul. Upon arrival there is a short but fairly steep hike up to the temple from either the South or East Gate, but the thickness of the forest keeps visitors cool even on hot summer days. The serenity of the pathway up also happens to be the perfect foreshadowing for the rest of the experience at the temple. A Templestay at Jeondeungsa Temple offers participants the unique opportunity to gain inner peace and experience cultural activities in the natural, serene setting of the mountain ridge. Practitioners can follow a typical monkâs daily routine by taking part in Buddhist services, formal monastic meals, meditation and dialogue, or they can choose to design their own schedules if they would rather maximize the amount of rest they experience during their stay. At 1,118.8 meters, Mt. Mindungsan in Jeongseon, Gangwon-do, is not the tallest mountain in Korea, but is still fairly unique; rather than the lush forests found atop other peaks around the peninsula, its summit is almost devoid of trees (hence the mountain’s name, which means “empty mountain”), covered instead by great fields of Eulalia grass. In September, the treeless expanses transform into great silver and gold grasslands of reeds waving in the wind like a silver sea. It’s really quite a spectacular sight. Most visitors to the festival come to hike up to the giant fields of reeds. There are plenty of other things to take in at the festival, though, with cultural performances, concerts, rock climbing contents, photo exhibits and much, much more. GETTING THERE: Buses to Jeongseon depart from Seoulâs Dong Seoul Bus Terminal (Travel time: 3 hours, 40 minutes). From Jeongseon, take a local bus to Nam-myeon. Fields of eulalia grass near the peak of Mt. Mindungsan in Jeongseon, Gangwon-do. Photographed by Robert Koehler.